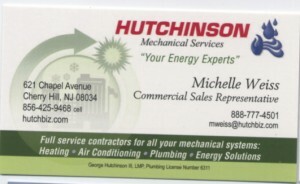 Hutchinson Plumbing Heating Cooling Serving the South Jersey Community for Generations George H. Hutchinson, Sr., and sons William A. Hutchinson, Sr. and George H. Hutchinson, Jr founded the Hutchinson family business in 1948. George and his sons started Hutchinson Engineering with their accumulated wealth – $35 in a cigar box – in rural Haddonfield, New Jersey. In this post WWII era, the Hutchinsons would do anything, from their desired trade of plumbing to changing storm windows, just to make a go of it. And they succeeded, changing their name to Hutchinson Plumbing in 1954. By the mid-1960s, they were Haddonfield’s largest and most successful plumbing contractor. In the 70s, the third generation of Hutchinson joined the business and continued to grow the company, adding air conditioning, large mechanical construction and general construction to its business lines. Hutchinson also entered into the government contracting business on both the local and national level. By 1998, sales had grown to $29 million dollars a year. The five sons of founder Bill Sr. – Bill, Ed, Fred, Tom and Bob – and George III, George Jr.’s son, worked side-by-side for over 30 years. They each gained valuable experience in the family business at a young age, working in various roles including dispatcher, technician apprentice, material handler and more. Learning the business from the ground up enabled them to become knowledgeable on all aspects of the business, while helping each of them to find their own place in the company based on individual interests and talents. In the mid 80′s they assumed leadership roles in the business. Today, Fred is CEO of Hutchinson Plumbing Heating Cooling and heads the Residential Division, Ed is President and manages the Commercial Division, Bill Jr. is Senior Project Manager, Bob is the Manager of Information Technology and Tom is President of Barth Plumbing Heating Cooling. George III owns a minority interest in the business, having left to form his own consulting business. A close relationship exists between the Hutchinson brothers. They meet weekly in a combination social and business meeting to exchange their thoughts, catch up on family, debate world events, and discuss short and long range business plans. Disagreements are common and debate is lively. However, when a solution or course of action is decided upon, all involved put their support behind it. Four brothers live in Haddonfield and the other in Moorestown. Their children attend the same schools or play with – or against – each other in sports leagues, along side the children of Hutchinson’s neighbors, employees and customers. Hutchinson is a close-knit family, both within its own members and with Hutchinson employees. From company family picnics and parties to participation in community charity and fundraising events, Hutchinson and its employees enjoy a camaraderie that is a product of being a family-owned business. Hutchinson maintains a supportive atmosphere that enables employees to succeed in their careers and lives. Training employees in industry and life skills is an ongoing commitment as is helping and lending support to employees in need. The business atmosphere and treatment of employees is perhaps best described in the words of a long-term employee in the company newsletter. “It’s a family run business and although everyone works hard, it’s a comfortable, friendly atmosphere. The staff is knowledgeable and we really do melt into one big family. And I think this is reflected by the number of satisfied customers we have.” As the Haddonfield/Cherry Hill area changed from a rural community to a more populated suburban area, Hutchinson grew to meet the needs of their growing number of neighbors. The business was built on and maintains a strong philosophy that service matters. A simple, straight-shooting approach has served Hutchinson – and its customers – well. These business practices have allowed Hutchinson to surpass its competitors at all levels. Evening dispatch, round-the-clock service and a state-of-the-art communication system help Hutchinson maintain its competitive edge. Hutchinson works diligently to always do the right thing both as it relates to their customers and their employees. Its trained technicians have the experience and expertise to service the most complex heating/air conditioning and plumbing systems. Hutchinson’s mechanical background and engineering recommendations have resulted in innovative, practical solutions to serve each customer’s needs. A priority of Hutchinson is having a complete knowledge of all the laws, regulations and building codes that effect its operations and then monitoring and enforcing compliance by its technicians. The management team commits time and effort to anticipate market changes to remain on top of the industry and offer its customers the best products and services. Identifying and targeting specialized niche markets helps maximize profitability. Also, the management team believes in accountability and puts responsibility for each division’s revenues and profitability squarely on the shoulders of the division head. The family members discuss issues openly, resolving disputes and supporting final solutions regardless of personal position, allowing the best interest of the business to always come first. In 1998, Hutchinson made a strategic business decision to merge its operations with Conectiv Services, a local utility provider, becoming the South Jersey Regional Operation Center for Conectiv. The Hutchinson family members maintained pivotal positions in the operation of the company and transitioned its employees into Conectiv. Three years later, Hutchinson re-acquired its company from Conectiv and also purchased Barth Plumbing Heating Cooling in Sea Isle City, NJ, and Wittman Heating and Cooling in Moorestown, NJ. Today, Hutchinson is South Jersey’s largest HVAC Company and has been voted for eight straight years “The Best” heating and cooling contractor in South Jersey in the Courier-Post Readers’ Choice Best of South Jersey. The Hutchinson family has always believed that it is important to participate in and contribute to the enrichment of its community. Hutchinson sponsors a number of local children’s sports teams, is active in the Haddonfield Little League and Moorestown community sports, is a contributor to the Katz Jewish Community Center and supports its annual Kidland event, and is a longtime supporter of the Juvenile Diabetes Research Foundation. Fred Hutchinson and Ed Hutchinson were the 2001 Corporate Recruitment Co- Chairmen for the Greater Delaware Valley Chapter’s South Jersey Branch Walk To Cure Diabetes to benefit the Juvenile Diabetes Research Foundation (JDRF). They were responsible for working with the Committee Chairperson and JDRF staff in recruiting corporations, small businesses and other organizations to participate in the Walk To Cure Diabetes. In 2006 Fred Hutchinson was honorary chairperson for the JDRF Annual Gala Event. Members of the Hutchinson family are active members of their communities, contributing their time and resources to the benefit of many. Ed Hutchinson is on the Board of Directors of the Family “Y” of Burlington County, the Camden County Workforce Investment Board, the Sun Bank Advisory Board and the Board of the Southern New Jersey Development Council. Tom Hutchinson is on the Board of OLLH Foundation Committee, is the Chairman of Our Lady of Lourdes Golf Tournament is a past president of the Haddonfield Jaycees, and is on the Board of Tavistock Country Club. Fred Hutchinson is a member of the Rotary club and the Dealer Council and serves on the Board of Directors of the South Jersey Chapter of the Juvenile Diabetes Research Foundation. He holds Certificates of Excellence in Building Analysis, Envelope, AC and Heat pump as well as Heating Professional through the Building Performance Institute (BPI). Bill Hutchinson is a member of the Haddonfield Planning Board, a Board member of the Brookfield Academy and a past president of the Haddonfield Jaycees. With the third generation of Hutchinson’s at the helm of this thriving company and the fourth generation coming on board, Hutchinson Plumbing Heating Cooling looks forward to continued growth and success by carrying on the tradition of excellence in service and commitment to family and community. I have known this company for a long time, they have excellent service.